- The scope must be easy to move around – move the scope with or without wheel barrel handles. 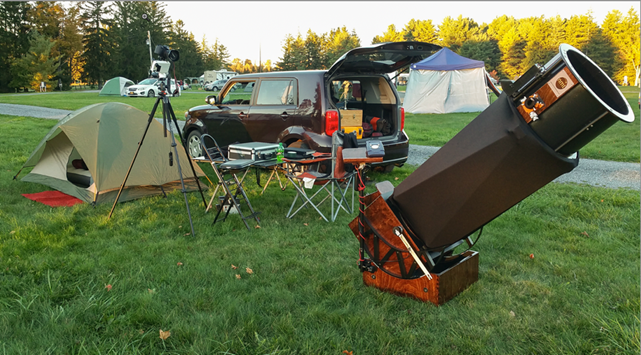 - The scope must support fast setup – from car to collimated in under 10 minutes. - No ladders or steps – I’m not getting younger, and I’m only doing this once. - Premium quality optics as part of the order. Beautiful telescope! When you wrote that "I’m an avid collector of meteorites, and I really wanted to make that interest a part of this instrument", what design features of the telescope did you customize for that? Thank you for taking the time and putting the effort into an actual review/article. Before I departed the hobby years ago, there were two aspects that I felt made Cloudy Nights the best site for amateur astronomy, the best reviews/articles and the forums. Over the years, it seems the former has ground to almost a halt and the latter has taken over. That's not all bad, but reviews in the forums are often severly shortened by the author to a couple or few paragraphs, not as categorically organized, and have a more informal feel to them. I, for one, appreciate the community driven reviews and I do hope to see these types of articles continue to be written. At NEAF I asked George N where you were. He didn't know. 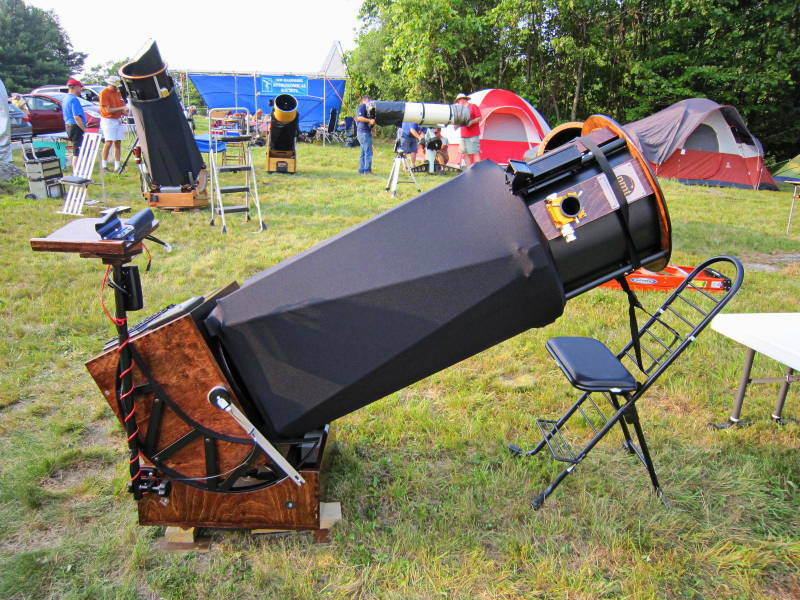 Very very Good review, I am the owner of a very fine 11"f/4.5 New Moon Telescope. Would you say is very consistent with what I've found. It truly is an object of beauty. It may go in my living room. What about a crucial feature: the weight? By the way, this should also be in the reflectors forum where people interested in reflectors can see it. Thank you very much for the kind words. I really love my scope. You are right about the weight - of course forgetting to mention it kind of speaks for itself. Obviously, a 16" scope is going to have some weight to manage, but it has not been a problem for me. The scope comes with wheely handles, but I almost never use them in the field. I can carry the mirror box and the rocker box by hand to where I need to put the scope typically (as long as it is not too far). Many of the design considerations made are intended to reduce weight such as the bearings and the low profile mirror box. If weight is a concern New Moon offers their new hybrid design which really reduces weight. How much does it weigh? Yes I understand the author can move it, but that doesn't help me know if I can move it. How long did it take from order to delivery? A month, three months, six months or a year? Or was it more? A rough total cost would be nice. I googled the company name and found the website. Looks like the basic setup is $8k with $2k of options. No info on the weight or delivery times. Nice article but it would have been better with the above missing (important) information. Hello, yes many of us often forget to mention the things that are just part of the process and were not issues. Hope this helps with your questions. Delivery time for my build from order to delivery was 8 weeks, as we agreed to at the time of ordering. The last week of that wait was driven by me, as I was out of town for business. With that being said, I'm sure this is dependent on current demand, backlog, etc as is the case with all custom dob builds. The biggest driver for the build is the schedule that the mirror makers can perform to. I'm not sure if there is such a thing as "rush" pricing on the mirrors or not. I don't have an exact weight for each component. Not sure I have anything that can accurately measure it here at the house. Here are some estimates based on comparing the lift to a 25 lb bags of rock salt I have in the garage, but they are estimates. Mirror Box: ~60 lbs (includes custom sliding counter weight & meteorite display box). Weight is a huge requirement, and there are different ways to game the weight on a larger aperture dob.. Smaller aperture would weigh less. NMT's newer hybrid designs weigh a lot less than classic dob designs (I prefer the classic Dob). Accessory choices and trade offs on the counter weights can gain back lbs if you need it to. 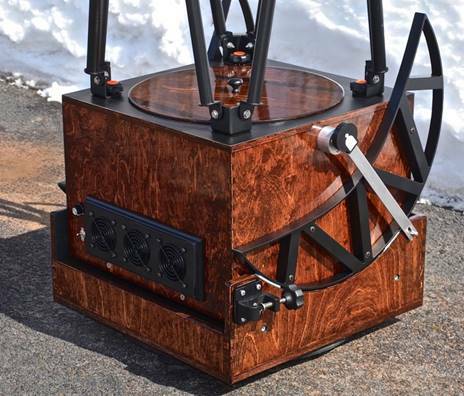 With a lot of this in mind, if weight is a concern and you are buying a wood based Dob, you should work with the maker of the telescope to match the design to your weight needs. That is the beauty of getting a custom made scope - you have options and the flexibility for tradeoffs. Time has passed since I purchased, and the pricing is quite a bit different now in just a few short years. Demand is building for these types of scopes and mirror supplies are strained. Being a custom job, options/customizations drive a lot of the cost. What mirror is chosen can really swing the cost a lot (mirrors are about half the cost), and I haven't seen the mirror pricing going down. I also requested a few custom items as well, which are not on the "options" list. I think the scope lists in default state at $7500, and the options are solely up to you depending on your needs. The only options I purchased in my build was the Argo Navis/encoders ($900) and the tablet stalk ($148), and these were enough for me. Great review, Patrick! 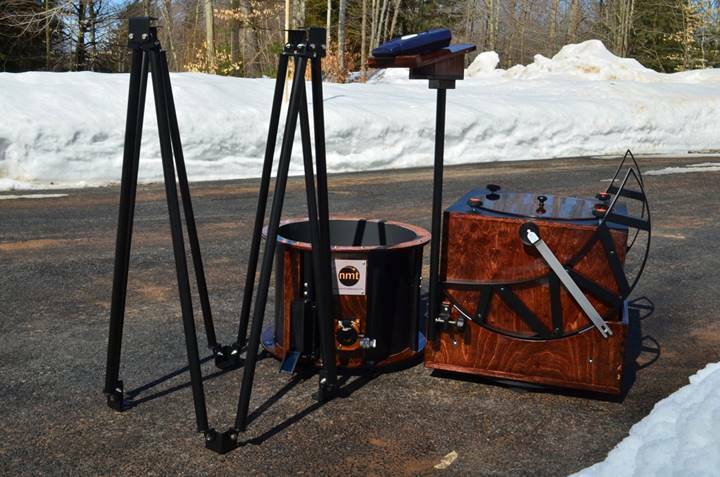 I'm thinking of New Moon Telescopes for my one future big Dob. For me, though, crucial factors are the weight and size of the individual units of the Dob. I own a two story condo with a double staircase inside the house, a standard size front door the only exit, and then a half-dozen porch steps to manage before even getting down to ground level. When I saw that estimate of 60 lbs for the mirror box, I figured, "Nope, not for me." Since I don't have a garage to store the Dob, wheelbarrow handles would be no help at all. Beautiful looking telescope. Thanks for sharing your story. Very nice scope. Thanks for the review. I bought a big scope last year, an 18" Obsession UC - I'm really enjoying it after using a Z10 for the past four years. I recently received a 15-inch "hybrid" model (f4.5) from New Moon with a Normand Fulum primary. Ditto all the praises that Patrick Manley's review heaps upon New Moon and owner Ryan Goodman! Everything about this scope is terrific—in performance, mobility, looks, and quality workmanship. And like Manley, I enjoyed a very satisfactory customer relationship with the builder. 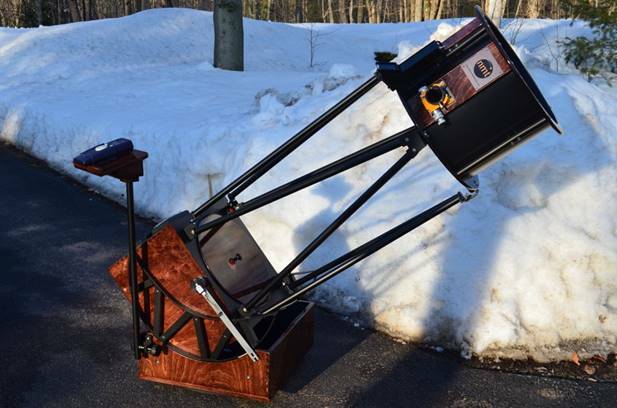 Ryan accommodated my odd desire for a premium 15-inch mirror (few optical shops make that size), installed a 10X60 Stellarvue finder at my request, and coordinated with Greg Blandin to integrate one of Greg's fine "Crossbow" equatorial platforms into the scope's rocker box. Thanks to those two, I can easily wheelbarrow the entire setup from garage to viewing location and begin observing/tracking in about one minute. Having had this rig for only six weeks, I've dissembled and transported it by car on only two occasions. But as reviewer Manley indicates, doing so is quick and easy. And all fits into my compact VW Golf SportWagon with much room to spare. Yes, this is a "Wow" scope. The moon, planets, close doubles, and DSOs—all Wows! And like Manley, I'm finding that Wow+easy setup has doubled my observing time. What a beautiful-looking scope with some nifty innovations. Really like how the truss poles are connected together in a one-piece unit. You got a very nice telescope, I am impressed with the woodworking in particular. I like the one-piece truss especially, I implemented a simple version of it for my 10-inch, through nowhere near as elegant as yours. You'll find it to be probably enough telescope for a lifetime. I've looked through bigger telescopes, but a 15 or 16-inch F/4 or F/4.5 is right in the sweet spot for big aperture views, and yet you can observe seated or standing without a ladder while being able to put the telescope in many cars. I'm sure the views are as impressive as the mechanics and the aesthetics. Clear skies! As far a weight is concerned,the hybrid design is very light,my 11"F4/5 New Moon telescope weighs 42 lbs and has wheelbarrow handles and a laser finder and an observing stalk; i wanted to keep weight down and Ryan was very understanding and helpful, and ingenious; great to work With.I had Ryan rework a very heavy Starmaster and the total cost was about $3100 but this was an introductory price. I've always been impressed, both optically and aesthetically, with Patrick's 16" New Moon Dob. It's truly a work of beauty. Here's a photo that I took of his scope in 2014 at Stellafane. Great review and a very pretty scope! I would love to read your detailed observing notes using this instrument as well. I have just placed an order with Ryan at New Moon Telescopes for a 16" f/4 Fullum optics hybrid due for delivery in June. I plan to submit a review soon after but I agree the process has been very good so far. 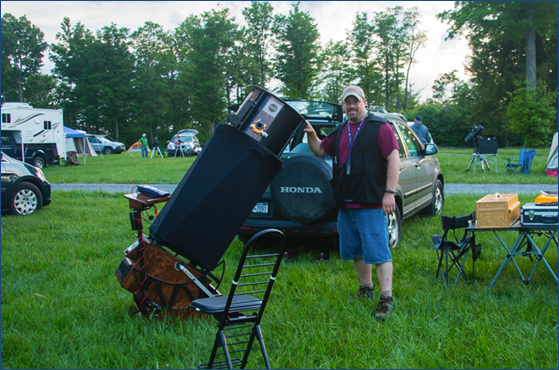 I don't need to read Patrick's observing notes because I get to look thru his scope maybe a dozen nights per year when we are set up next to each other at star parties - or he brings it to Kopernik Observatory to use for visual observing while we are imaging with the 20" RC there. I'm always very happy to take a look thru this fine instrument. It provides great views and never causes a fuss when observing with it. It is also a scope that is easy to live with. I've watched Patrick take it apart and put it back together - twice - in about 10 minutes or less, while explaining it all to some on-lookers. The only NMT Dob I've been more impressed with is Ryan's personal 20-inch F/3.3 "hybrid" that I was set up next to at the Sept 2017 Black Forest Star Party...... altho I did need to bend down to look thru the eyepiece while the scope was pointed at the zenith! A few people walking past asked me "Is that a 12-inch or a 14"? "No! It's a 20!" ....but then I never got to look thru Ryan's 27-inch before he sold it - altho he did offer to drop it off at my house - if I paid for it of course! Last time we were in contact Ryan said that he hopes to have up to 6 Dobs on display at NEAF 2018. I've seen his vids. those are some good looking scopes! Thanks for an inspiring review. This is a fine instrument to look at and I bet it performs exceptionally well. I can admire the effort and craftsmanship needed to build such a high end product. Thanks for sharing your very helpful review. I have had the pleasure of looking through several of Ryan's scopes over the past few years and have been extremely impressed. The views are exceptional and the construction quality is second to none. In my opinion, his designs are highly optimized to provide really good service as telescopes while still being very attractive products. For your situation, this telescope definitely is not for you. I own a 12.5 inch F5 Portaball. I barely could make it up and down the stairs in your house with this telescope. I think a 12" truss-type would maximize what I'd want to handle in my circumstances. I'd have to move to a house with a garage or at least a big deck before getting a bigger scope than that. Yes you need to ensure you have the means to handle a scope. An investment like this would be a crime to turn into a dust cover! I will say that I have seen many very creative ideas to get to a larger optic, but always ensure that you will handle and use it! Yes ensuring that you have a scope you can manage is first and foremost. 12" is still quite a bit of aperture, providing views for many years. See my prior response to GeneT.